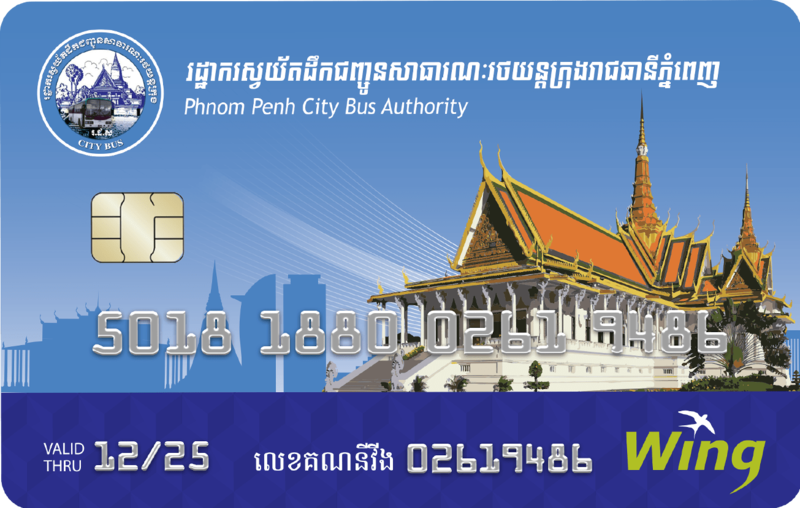 Have a swift and easy ride with Cambodia's first cashless travel card! Need a ride to go to school? Out to shop? Rushing to work? Or just want to roam around the city? Get the City Bus Card powered by Wing for a more flexible public transportation. No need to carry cash when traveling around the city. Just tap your City Bus Card and enjoy a hassle-free ride. The bus card tailored to your lifestyle. The City Bus Card by Wing is available in Blue and Green to perfectly fit your needs and activities. The Green Card is the standard card meant for general customers who do not fall into the categories of the Blue Card. This card is especially made for monks, students, people with disability, kids with height below 1 meter, and elderly people. Availing this card gives you 180 city bus rides. Go to City Bus Station Card Counters. To avail the Blue Card, present your student/monk ID and mobile number. Pay the card fee and immediately get the card. Just swipe and tap, and your card is ready for City Bus. Turn your bus rides into unique and stress-free experiences with Wing. No more worries when it comes to bringing the exact fare or getting change. Enjoy the convenience of cashless payment. Get updates about your travels, expenses, and credit with the USSD function and WingMoney App. Wing gives you 4 simple ways to cash-in or reload your City Bus Card. After getting your City Bus Card or activating your Wing card, you can immediately use it for your city bus transportation. Just tap your City Bus Card or Wing Card on the farebox every time you board and leave the city bus. Deductions will automatically be implemented for every ride. Make sure to cash-in your Wing City Bus Card before your credit runs out or to extend the validity of your card. City Bus Station - The Blue Card and the Green Card can be both reloaded at any City Bus Station. 6,000 Wing Cash Xpress agents - Cash-in your Green Card with any Wing Cash Xpress agent. FTB Fund transfer to Wing - Experience quick and easy transfer. Available to Green Cards only. To avail this card, customer must pay KHR 4,000 or USD 1.00. This is equivalent to 180 bus rides. Customer are not required to pay to reload the Blue Card with 180 rides. This reload is valid for 6 months only. Customers must top-up their credit at City Bus agents only. To avail this card, customer must present their identification card (monk, student, and others), as well as their mobile number for registration. Customer needs to go to any City Bus agent to get their City Bus card, both Green and Blue Card. There is no refund or exchange of cash once the card has been purchased. Q1. What is Wing City Bus Payment? A1. Wing City Bus Payment is a cashless payment method for using City Bus service. Customer can only use the cards to pay the bus fare. It has changed from cash payment to electronic payment which is modern, fast, easy and secure. Q2. How many types of City Bus cards are there? A2. There are two types of City Bus cards: Blue Card and Green Card. Q3. What are the features and functions of the Blue Card? A3. Blue Card – is the card for the special citizen like monks, students, kids with height below one meter, disable person, and elderly with the age above 70 years old. Card top-up fee: free for the next top up of 180 times credit valid for 6 months. Q4. What are the features and functions of the Green Card? Q5. Will City Bus customer get the discount for the payment like normal Wing card? Q6. Can City Bus customer purchase online through Wing? A6. City Bus customer can purchase online through their Wing accounts like normal Wing user (M-WAC). Q7. Where can I get my City Bus cards? Can I get it at Wing head office or Wing agents? A7. You can go to any City Bus Agents to open your City Bus Account, but not Wing Head Office nor Wing Agents. Q8. Can I top up my City Bus package and cash in at Wing Agent (WCX) or not? A8. For the Blue Card-No, You can top-up the package at City Bus agent only and you can cash in at any Wing Cash Xpress to perform other transactions through Wing. You can check your bus package and balance in your account through USSD (*989#). While for the Green card-yes, you can cash-in at any Wing Cash Xpress. We suggest you to download the Wingmoney Mobile App to easily track your balance. Q9. What is the operating hour for City Bus counter and their bus operating hour? A9. City Bus counter will start operate from 8:00am until 17:00pm while the Bus will start from 5:30am until 20:30pm. Q10. Can I use Wing card for riding the City Bus? A10. You can use the Wing card for riding the City Bus only if you have activate your card at any City Bus agent or at Wing head office. Q11. Can I use QR scan for riding the City Bus? A11. Currently, the function of the QR scan is not yet available. Q12. Can I pay the bus fare through USSD (*989#)? A12. You cannot pay the bus fare through USSD (*989#). Q13. What is the fee charge for the City Bus? A13. For Wing and City Bus Green Card, the fare as per City bus regulation is KHR 1,500. For City Bus Blue Card, from the initial acquisition of card it has 180 rides. If the credit has been all used you can top-up at any City Bus agents for free with another 180 rides. The new balance will be accumulated and expired in the 6 months period counting from the date of top-up. Q14. Can I use City Bus Blue and Green Card to perform Wing transaction such as money transfer or phone top up? A14. Yes, you need to cash-in to Wing Cash Xpress Agent/Wing HO to perform this transaction from Wing. Q15. Can I use Wingmoney Mobile App if I have City Bus Card? Q16. What is the validity of the City Bus cards? A16. There is a difference between card validity and credit balance validity. Card validity will depend on the year indicated on the card for both Green and Blue while credit balance (bus package) of the Blue card will valid for 6 months counting from top up date. Q17. Can I use City Bus Card with Wing Merchants? Q18. Is there any fee charge for the Wing card activate? Q19. What should the customer do if they lose their cards? Can he/she transfer the remaining balance to the new card? A19. Customer needs to go to City Bus agent for the card loss; then, City Bus agent will contact to Wing Call Center in order to block the account and transfer the balance and the remaining package of City Bus from the old account to the new account. Q20. If the customer lose their cards, do they need to pay any fee? A20. Customer need to pay the fee similar to the fee of issuing the new card. Q21. If the City Bus agent make a mistake in register the account for the customer, what should they do? A21. It is not possible to adjust the information of the account register at all after the issuance of the card. For the mistake in registering the account such as name or date of birth, customer need to come to Wing head office for the correction similar to M-WAC customer. Q22. Can customer still use the City Bus Card to ride the City Bus if there is a mistake of entering the password (3 times) and it has been blocked? A22. The function of the City Bus will still be able to perform. Q23. What is the process of the customer verification if the customer contact to Wing service center to resolve the problem? A23. The process will be similar to M-WAC. Q24. Should customer contact to City Bus or Wing if they have the problem? Can customer contact to City Bus? A24. It will depend on the problem that customer encounter. Contact to Wing if there is any problem with the cards and Wing service. Q25. For the customer who has the City Bus card (both types), can they perform W-2-W? Q26. How many City Bus card that customer get with their single phone number? A26. Customer can register and get their City Bus card only one for one phone number. Q27. Can the City Bus card be transferred to another person? A27. You cannot transfer the right of the card, only the owner that can use that card. Q28. Can customer use the phone number of the other people to register? A28. Customer cannot use the other people phone number to register for the City Bus card at all. Q29. Can City Bus customer open more than 1 account? Q30. If I already have the Wing account and I would like to link it with the City Bus card on the Wing Mobile App, can I do that? A30. You can link your Wing account to your City Bus account on Wing mobile App. It can be link/bind up to 4 accounts. Q01. If City Bus agent type in wrong password and the app has been blocked, what should they do? What about the account that bind with the app has been blocked, who should they contact? A01. City Bus agent should contact to the sales representative (Enterprise Business- Public Team). For the binding of the account has been blocked, please contact the Wing call center. Q02. Can City Bus agent make change to the information of the customer such as name, gender, date of birth if there is a request from customer after the register? A02. City Bus agent cannot make any change to the information. They need to contact to Wing call center for any change. Q03. What is the Class of Service of the City Bus card? Q04. Is there any special offer for Wing staffs? A04. Currently, there is no any special for Wing staffs at all.